Gemini traits show up quickly in their conversation and interaction with those around them. Here is a quick visual guide to Gemini Traits. Quick to change with the conversation and with the social environment surrounding them. 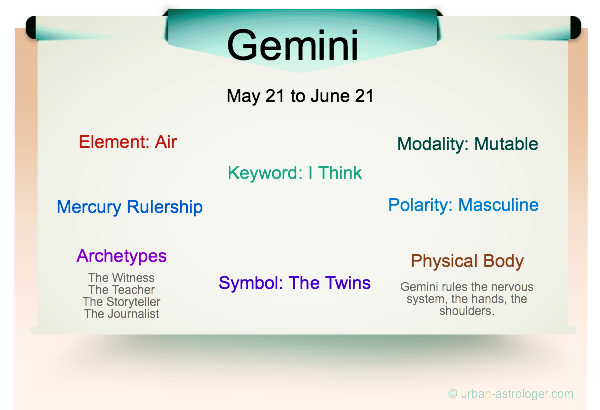 Versatile and agile ... restless, restless is a keyword for Gemini. As a Gemini, you are intelligent, quick-witted and inquisitive. Ideas abound and the exploration of them is a passion. Boredom is never hanging around long for you. Since there always seems to be a surplus of energy you might have difficulty sitting still. You like to be around people and possess a craving for that constant interaction. Your Gemini mind is always examining the many sides of a situation, all the options available to you. This insatiable curiosity is best used in an outlet of some sort. Communication is instinctive for you so if you can utilize a medium to make productive use of this mental activity - you can do some great things. 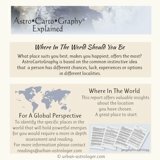 In its most positive expression your Gemini traits are channeled in intellectual matters and the diversity of scope is not limited in any way. The	glyph for Gemini represents the heavenly twins and its ruling planet is Mercury. Gemini is the third sign of the zodiac a member of the the horns of the ram. Aries	is the first sign of the zodiac, a mutable sign, masculine and of the air element. The Sun enters the sign of Gemini around 21 May and exits around 21 June. Symbolically the written symbol of Gemini corresponds with the Roman numeral for 2 which indicates the essential duality of the sign.